The Mount Whitney Mountaineers Route is a steep, straight shot from Whitney Portal to the mountain’s summit. It was pioneered by John Muir who referred to the traditional main trail as for “soft, succulent people.” His comparison is not that far off. This trip started in the Alabama Hills, with a typically crystal clear sunrise view of Mount Whitney catching the first light of the day. The Alabama Hills are the perfect staging point for a backpacking trip in the Sierra, and I have started many weekends with this incredible view of the Sierra crest. On this particular day, I had the distinct satisfaction in knowing that I was about to climb the mountain that I was staring down. Normally, a trip to the top of Mount Whitney should be preceded by a day or two of acclimating at higher elevations. It’s also the type of hike that many people specifically train for in the weeks leading up to the trip. I didn’t have the luxury of either of these methods of preparation. Soon enough, I would be wishing that I did. A week before the start of the trip, I had no idea that I would be ending the month by standing on top of the lower 48’s highest mountain. I was at work lamenting the cancellation of another Memorial Day Sierra trip due to early summer snowstorms in the mountains. May was a strange month in California this year. It was cooler and wetter than the three months preceding it, which led meteorologists to dub it the first “reverse spring” in Southern California in nearly 100 years. From our perspective, the strange weather pattern meant a cancelled backpacking trip near Devil’s Postpile. I always anticipate the first Sierra trip of the year the most, so I was pretty bummed out considering it was the Friday afternoon before a holiday weekend. My mood shifted with the arrival of an email from my friend Karl, who had also been forced to cancel a Sierra trip due to the same storm. He saw the strange conditions as the perfect opportunity that they were. With a fresh layer of snow in the upper elevations of the range and summer-like sunny days forecast for the following weekend, the stage was set for an extraordinary trip, and he had just the idea in mind. The Mount Whitney Mountaineers Route would still be covered in deep snow, but the approach would be a fairly simple off-trail trek up the North Fork of Lone Pine Creek. Karl had already taken the seventh spot on a guided trip with the Sierra Mountain Center, and there was one spot left. Ten minutes later, there were no spots left, and I was committed to a climb that I hadn’t given much consideration until that very moment. One week later, I would be heading up the now familiar Mount Whitney trail on one of my most memorable trips yet. After about a mile on the main trail, we began to head up the use trail up the north fork of Lone Pine Creek. From here on out, the route is significantly steeper and occasionally rugged enough to require a bit of scrambling. The occasional rock scrambles are easy enough to handle though, and route finding didn’t appear to be as difficult as I expected. There is well worn use trail for the majority of the hike. The one exception on the approach to Iceberg Lake is a stretch dubbed the Ebersbacher Ledges. This short stretch leads hikers up a network of narrow ledges, where a fall can sometimes lead to fatal consequences. Route finding here isn’t quite as straight forward, and there have been deaths here in recent years due to people losing the route and making a tragic mistake. Needless to say, I was happy to not have to navigate the section of my own for my first ascent, and having the experience of seasoned guides eliminated any potential trepidation that I might have had. We roped up for one hairy spot. Our guides understandably wanted to play it safe, and I wasn’t going to complain about the extra layer of safety. I was pretty comfortable as I traversed the ledge though, and most people who hike here do so without the aid of any ropes or anchors. I found the guides’ knowledge of the route to be their most valuable resource during this stretch. There are a few sections where it isn’t entirely clear where to go, and as I mentioned earlier, a wrong turn can have disastrous consequences if you aren’t careful. After the ledges, the trail returns to its normal state, and promptly reaches Lower Boy Scout Lake. The summit of Mount Whitney occasionally pokes its head above the ridge line, but open views of the mountain are non-existent until the moraines above Upper Boy Scout Lake. Soak it in while you can. The stretch above the lake traverses across a boulder field initially, and then it reaches a series of smooth granite slabs that represent the final stretch of hiking towards Upper Boyscout Lake. Travel here is exceedingly pleasant, and the surrounding views begin to contrast strongly with the more parched landscape on the lower area of the canyon. Our view of the thawing icefall off of Thor Peak further reinforced the fact that summer had not arrived yet at high altitude, and the nature of our trip snapped back into focus. I couldn’t help but nervously question why I was voluntarily entering the formidable landscape. We setup camp at Upper Boyscout Lake and were greeted with the type of typically fantastic Sierra views that keep me coming back every chance that I get. The following morning we started up the mountain before sunrise, with only our headlamps and the soft predawn twilight to illuminate the trail, which was now partially covered in snow. Normally, getting up at 4AM is the last thing I want to do, but whenever it precludes an adventure up a mountain, I will arise giddy with anticipation. Knowing that the day will start with views like this makes it easy. We reached the moraines directly below Whitney’s eastern face just in time to see the morning alpenglow illuminate the peak. I’ve seen this brilliant light show on the Sierra Crest countless times, but never this close before. The impressive two thousand foot vertical wall was less than a mile from us and was basked in a brilliant red light that was impossible to take your eyes off. After letting that incredible sunrise view sink in, we continued on up the trail towards Iceberg Lake, and Whitney’s eastern face continued to loom overhead. It also acted as a constant reminder for exactly how much we still had left to climb. As I looked up at the face during the ascent, the reality of our ambitious day became increasingly clear. Soon enough, we were at Iceberg Lake, which fully lives up to its name this time of year. It was still so frozen that there was no water to be had up here. As it turned out, there were no solid water sources along the route all day long. I ended up having to ration my water much more than I would have liked, which may have contributed to some of my difficulty ascending the Mountaineers Route chute. At Iceberg Lake, the route quickly morphes from a hike to a climb. 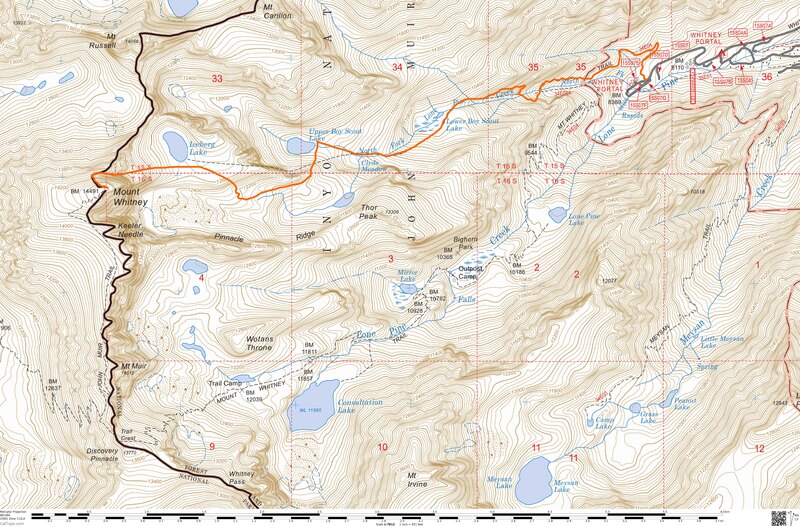 The rest of the route would have us ascending directly up a snowfield for a couple thousand feet. We donned crampons and ice axes, and began the laborious climb up the Mountaineer’s chute. Looking up, progress seems interminable. An absolutely exhausting stretch of breaking trail up the steep snowfield would usually result in a view that was identical to the view at the start of the stretch. Fortunately, the view towards Owens Valley clearly illustrated our progress up the slope and provided some incredible views to boot. About halfway up the chute, my lack of conditioning and acclimation finally caught up with me. One of the downsides of going with a guided trip is that it is hard to find your own individual pace, especially in a chute like this when you are roped with your fellow climbers. I found the group’s pace to be slightly quicker than my own comfort zone, but my choices were limited to halting progress or sucking it up and continuing the charge up the steep hill. As the ascent continued, I became increasingly exhausted, until I reached a point where I seriously doubted my ability to continue. Labored breath turned into nausea, and I quickly found myself fighting back bouts of vomiting. I try to be vigilant about my condition in the backcountry, especially when altitude sickness is a possibility. In this case, the evidence was undeniable, and the only question was how I should proceed with this new information that had made itself all too clear. My first reaction was extremely cautious, which I guess I should be happy about. I didn’t feel like I could safely continue at the pace that my group was ascending, so I simply asked my guide Ryan if it would be okay for me to either stay put or to descend back to camp. His answer was expected, but not what I wanted to hear. I could either continue on, or force my group to descend all the way back down to Iceberg Lake. At that point, they could re-attempt their ascent, but the loss of time and energy would probably be too costly for a summit bid to make any sense. The thought of ruining this group’s trip was even more unpleasant than the idea of battling altitude sickness at fourteen thousand feet, so after catching my breath, I continued up the mountain. At the top of the chute, there is a small plateau where we had the opportunity to take a break and prepare for the final 400 feet to the summit. There is a great view of Mount Russell to the north, with Owens Valley peeking from behind. The view and a small break left me feeling a little bit better, but I still was nervous about what laid ahead. There are a few different chutes that people use to ascend the final 400 feet of the mountaineer’s route in the summer months, but when winter conditions prevail, the first chute is the only logical choice. We roped up and allowed our guide Ryan to hike up the first pitch, without having seen what we were about to throw ourselves into. Once Ryan let us know that he had set up an anchor and we were on belay, we turned the corner and saw what the final stretch of the climb entailed. I was first in line, and I instinctually blurted out “this is the real deal!” to noone in particular. I am often guilty of hyperbole at high altitude, but in this case, I wasn’t lying. The final 400 is steep enough to be treacherous anytime of year, but it is not technical enough in most conditions to necessitate the use of ropes and anchors. In our case, the snow on the slope was soft enough that the ropes felt more like an additional insurance policy instead of required gear. In either case, I was glad to have them, just as I was happy to be climbing behind an experienced climber like our guide Ryan Huetter, whose calm demeanor vanquished any uneasiness I might have normally had. The altitude sickness that had plagued me earlier seemed to vanish as my body was flooded with adrenaline and my eyes focused on dazzling views into Sequoia, Kings Canyon, and beyond. Perfect moments like this are rare, and they remain permanently etched in my mind. At last, we reached the summit plateau and got to enjoy the flattest stretch of the entire climb on our way to the official summit. From the summit, I enjoyed some of the finest views in California and finally let the magnitude of the experience settle in. It was a spectacular day in the Sierra, and the day’s climb was a milestone that I hope will lead to even more ambitious trips in the future. I’m hooked for life. Our ascent had taken about seven hours, which didn’t leave us with much time to linger at the summit. After about twenty minutes, we were heading back down the mountain. Upon returning to the Mountaineers Route chute, it was remarkable how much the conditions had changed in the few hours that had passed. There were large patches in the middle of the chute where the snow had melted out and exposed sections of granite. The more significant change was the overall softness in the snow. Having soaked in a few extra hours of the hot summer sun, the deep snowfield covering the chute was now soft slush, and most steps had me either slipping down the slope, or postholing down to my knees. Crampons are basically useless when the snow gets this soft. A couple of times, I had one leg slip while the other one sank deep into the snow, which forced my lower body into some uncomfortable positions. Once we reached the bottom, I felt elated that I avoided any major injuries. Back at Iceberg Lake, we removed our climbing equipment, and returned to hiking on solid ground for the rest of our descent. Compared to the terrain we had been facing all afternoon, the remaining stretch was like a walk in the park. Beautiful views of Whitney’s eastern flank providing a backdrop to the trail surely didn’t hurt. The final day of the trip felt like an epilogue after the momentous summit hike on Saturday. I made sure to snap a photo of Mount Russell catching the early morning light over Upper Boy Scout Lake, and off we went, with our main focus on Whitney Portal and the delicious burgers and beers waiting for us there at the trailhead. I don’t know of any other High Sierra trailhead with a grill right at the parking lot, and I can’t think of any one more fitting. We stopped at Lower Boy Scout Lake for a snack break, and somehow I got corralled into taking portraits of the group. I was more than happy to do so, and our group had such a great dynamic that it felt like a great end to our journey. Other than the e-ledges, the lower part of this hike is relatively straight forward. The views towards Owens Valley continued to be fantastic, but to be honest, at this point I had mentally transitioned and was fully focused on how amazing civilization would be after a few days of trashing my body at high altitude. The last part of the hike is a small stretch back on the main Whitney Trail, and compared to the rest of the climb, it’s like walking from your couch to the refrigerator. I practically ran down to the Portal with the promise of burgers, fries, and beer so close to reality. After gorging ourselves at the Portal, it was time to head off. Our ragtag team of strangers bonded by the shared goal of summiting a mountain disbanded back to reality. While that bond may have been temporary, the experience of the weekend will stay with me for a long time and most likely have a large influence on some of my future ambitions. I now want to summit the rest of the 14ers in California. Which one will be next? Fantastic trip report and photos as always! I have done it the regular way but this makes me want to go do this route now too! What guide service did you use? Thanks Josh. This trip was with the Sierra Mountain Center. There is a link to their page towards the top of the post. Beautiful photos & great report. I don’t think I’ll ever forget you exclaiming “this is the real deal!” as I was looking straight down into the abyss. You know, you could use a trail name. How about “Real Deal”? Nice! I’ve thought about heading up that way numerous times, but not so much to climb it, rather for the photographic potential for a dramatic sunrise around the Iceberg Lake area. Do you know offhand if camping there is permitted? Yes, you can camp at Iceberg Lake. I think I’ll do that next time I head up this way. Thanks Colleen! It’s always fun to get a new fan. The Mountaineering Route is really fun. I really enjoyed dayhiking up the main trail too, and I’m sure I’ll be on the summit many more times. It’s all good from any direction. My main advice outside of being cautious with the elevation and e-ledges, would be too keep an eye on the forecast. There might be fresh snow on the route at that point from an early season storm, or there might still be smoke in the area from the Rough Fire. It’s been a strange season. We waited around a few days and decided to head back home and wait things out. Even today, it looks like there is still some snow in the chute. Maybe in a few weeks we’ll try it again. I went up to Shasta yesterday and climbed the Clear Creek Trail. It was beautiful and surprisingly, not a soul there.